Jammu : Jammu and Kashmir Chief Minister Mehbooba Mufti today said nobody will be allowed to disturb the peaceful atmosphere of the state. Those who take the law into their own hands will be dealt with appropriately, she said after inaugurating a 1.5 km flyover here. 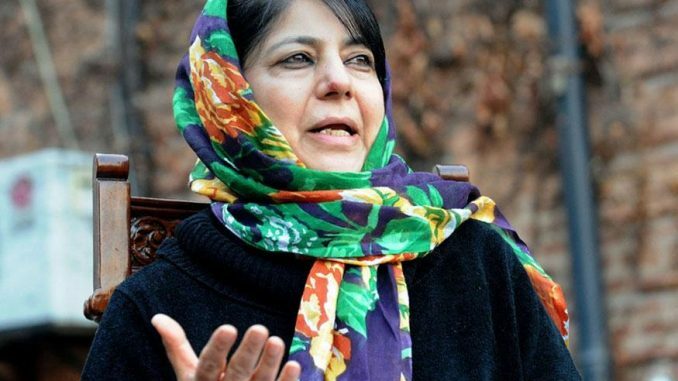 Mufti cautioned people against the nefarious designs of some “negative” elements, who want to derail the developmental process in the state by creating an “atmosphere of hate”. Complimenting the people of Jammu for maintaining communal harmony and brotherhood despite “provocation”, the chief minister said nobody will be allowed to disturb the peaceful atmosphere, and mischief-mongers will be dealt with sternly. The flyover from Bikram Chowk to Women’s College has been built at a cost of Rs 77.54 crore by the Economic Reconstruction Agency (ERA). Deputy chief minister Nirmal Singh said the project reflects the coalition government’s commitment towards developmental works. Speaker of the legislative assembly Kavinder Gupta complimented the people on the completion of the project.